The Red Cross collected some 27,000 fewer blood and platelet donations the weeks of Christmas and New Year’s than needed to sustain a sufficient blood supply. During this period, about 1,350 fewer blood drives were hosted by volunteer sponsor groups than required to meet patient needs as busy holiday schedules kept many donors away. 2/2/2019: 9 a.m. - 2 p.m.
1/15/2019: 1:30 p.m. - 6:30 p.m.
1/19/2019: 9 a.m. - 2 p.m.
1/21/2019: 10 a.m. - 3 p.m.
2/5/2019: 11:45 a.m. - 5:15 p.m.
2/6/2019: 11 a.m. - 4:30 p.m.
2/6/2019: 11:45 a.m. - 5:15 p.m.
2/7/2019: 11:45 a.m. - 5:15 p.m.
2/2/2019: 8 a.m. - 1 p.m.
1/24/2019: 12:45 p.m. - 6 p.m.
1/14/2019: 1:30 p.m. - 6:30 p.m.
2/15/2019: 9:45 a.m. - 2:45 p.m. 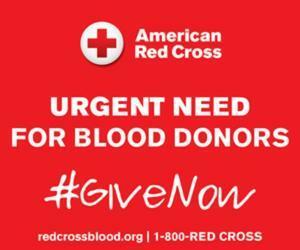 Eligible donors can find a blood or platelet donation opportunity and schedule an appointment to donate by using the free Blood Donor App, visiting RedCrossBlood.org or calling 1-800-RED CROSS (1-800-733-2767). Volunteer blood drive hosts are also critically needed to prevent the shortage from worsening this winter.